In the last two posts I argued that recovering a vision of the immanence of God is a way we might edge ourselves back toward enchantment. This vision of immanence involves embracing a sacramental ontology where we come to experience the world, in the words of Gerard Manley Hopkins, as "charged with the grandeur of God." Another way to say all this is that we edge back toward enchantment by recovering, in the words of Andrew Greeley, a "Catholic imagination." Catholics live in an enchanted world, a world of statues and holy water, stained glass and votive candles, saints and religious medals, rosary beads and holy pictures. 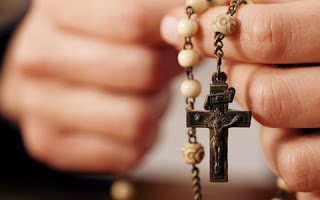 Because these Catholic paraphernalia are mere hints of a deeper and more pervasive sensibility which inclines Catholics to see the Holy lurking in creation. As Catholics, we find our houses and world haunted by a sense that the objects, events, and persons of daily life are revelations of grace. You can make a good argument that disenchantment was the unwitting outcome of Protestantism. Charles Taylor in A Secular Age makes this argument. For example, one of the impulses of Protestantism was to shift the spiritual load onto the laity. Holiness was no longer to be the occupation of "spiritual specialists," the clergy, monastics and saints. Everyone was expected to be holy. The domain of holiness and saintliness shifted away from monasteries, convents and cathedrals to the town, the realm of work and family life. As we know, there are no saints in Protestantism. These trends also effectively disenchanted the sacred spaces of Catholicism. There is no clearer example of the disenchantment wrought by Protestantism than comparing a Catholic cathedral to the auditorium where Protestants gather to worship. The cathedral is an enchanted, sacred and holy space. The Protestant auditorium is a disenchanted, utilitarian and functional space. Beyond people and space, time was also disenchanted by Protestantism. The holy days and seasons of the liturgical calendar of the church was gradually replaced by the time-keeping of the town, the secular clocks and calendars of the marketplace and the nation state. Finally, the demise of a sacramental ontology was also brought about by the Protestant rejection of the "real presence" of Christ in the Eucharist. The Eucharist became symbolic rather than sacramental, pointing to rather than participating in the life of God. Things weren't supposed to work out this way. By releasing God into the world the hope was that God would be found everywhere. But the exact opposite happened. By disenchanting people (the saints), space (the cathedral), time (the liturgical calendar) and the Eucharist, Protestantism banished the holy, the sacred and the enchanted. Basically, when every place is holy no place is holy. So there is a dialectic here. We need to recover an experience of the immanence of God, an experience of the whole world being charged with the grandeur of God. But in order to cultivate these experiences we must create and experience places, times, people and events as specifically and particularly holy, sacred and enchanted. This is the Catholic imagination. Edging toward enchantment means cultivating a sacred texture in life, recovering holy time and space. When it comes to hallowing, a disenchanted life is flat and homogeneous. There is no sacred texture. By contrast, an enchanted life involves cultivating a sacred texture to life, where moments, places and experiences are set aside for wonder, awe, mystery and transcendence. Enchantment is hallowing, the recovery of a sacred texture to life as witnessed to in the Catholic imagination.